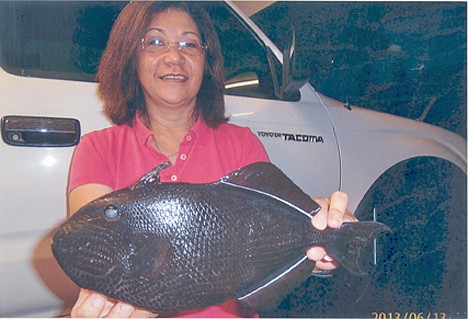 Pauline Sugimoto was dunking a California shrimp bait on her Shimano Solstace outfit loaded with 8-lb test line when she hooked her state record black durgon. The fish had 15 feet of water to test Pauline angling skill, but she managed to hang on and eventually land the fish there at Paradise Park (Puna) on the Big Island. Her catch weighted 1.7 lbs.